I’m Too Young To Feel This Darn Old! Does anybody else feel like the Tin Man from The Wizard of Oz when they get out of bed in the mornings? I swear I need a little oil can on my nightstand so I can simply move when I get up each day! Sad thing is, it’s not just when I get up in the mornings. My knees and feet get so stiff just from standing too long, and/or from walking a short distance. It reminds me of a Garth Brooks song of a similar name – I’m TOO young to feel this darn old! I tend to mentally beat myself up, and tell myself that it’s my own fault for carrying too much weight on my body. And, then I end up “punishing” myself by not taking measures to help the joint stress, like taking an anti-inflammatory. But, frankly, these “remedies” seem to me the same as applying a bandage to the problem. I know that losing weight is going to help my plight TREMENDOUSLY! But, it’s really tough to lose weight if you’re not able to move well in order to burn calories! So what IS the answer? Just suffer and not participate in life? Watch my kids and husband do everything while I sit on the sidelines? I’m going to give a new product a try! 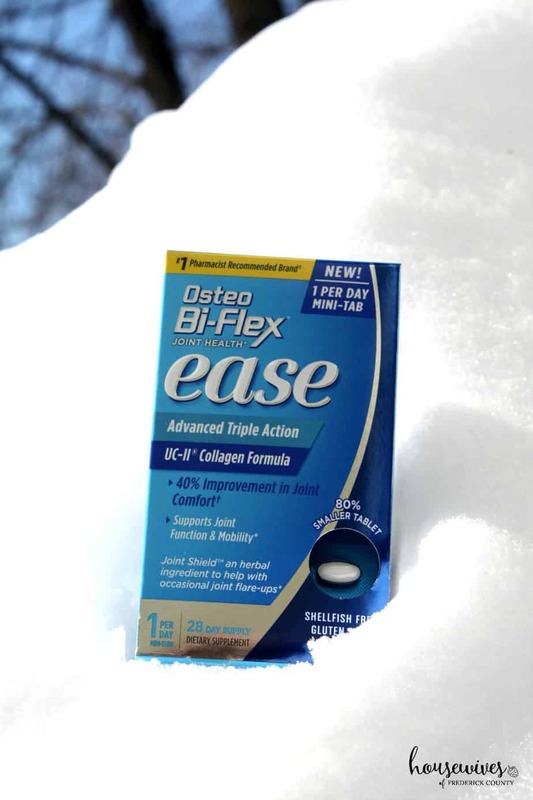 For the next seven days I’ll be taking Osteo Bi-Flex® EASE and sharing my experience with you! First of all, Osteo Bi-Flex® is the #1 pharmacist recommended brand.† That’s pretty impressive and gives me peace of mind! Check out their Facebook page too – lots of fun and helpful info there as well! But, the most important thing to me is the fact that I’m being proactive in changing my current status quo. My sons are both teens now, and it won’t be long before the days of spending regular, quality time with them becomes less frequent. I’m so excited to be starting this journey of #MadeToMove in 7 days with Osteo Bi-Flex® EASE! Here in Maryland (like many other areas of the US), we just experienced our first major snowstorm of the season! It was MAJOR! 35 inches of snow in our area! My sons were ecstatic and have been out making an igloo! My husband has been bonding with the neighbors while snowblowing pathways and digging our vehicles out. Me? I’ve been inside the house looking out the windows like a sad puppy dog, because attempting to walk through 35 inches of snow would be quite challenging, and even unsafe for me due to the immobility of my joints. So, yeah, this girl is ready to make that change. 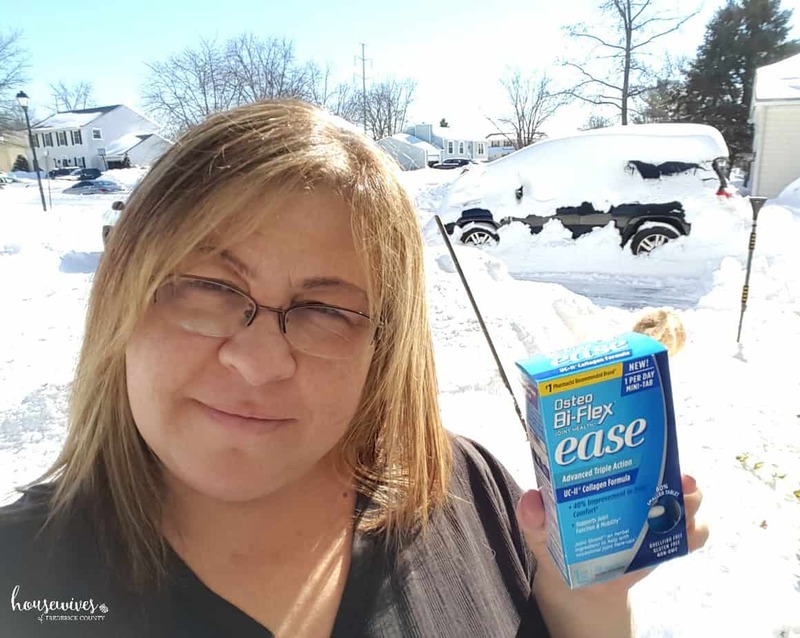 Stay tuned because I will be writing about my experience with Osteo Bi-Flex® EASE after my #MadeToMove in 7 days! Do you suffer from stiff, uncomfortable joints? How has it impacted your life? †Based on the results of the Pharmacy Times Survey among pharmacists who recommend a “bone/joint strengthener” dietary supplement, 2016-2017.